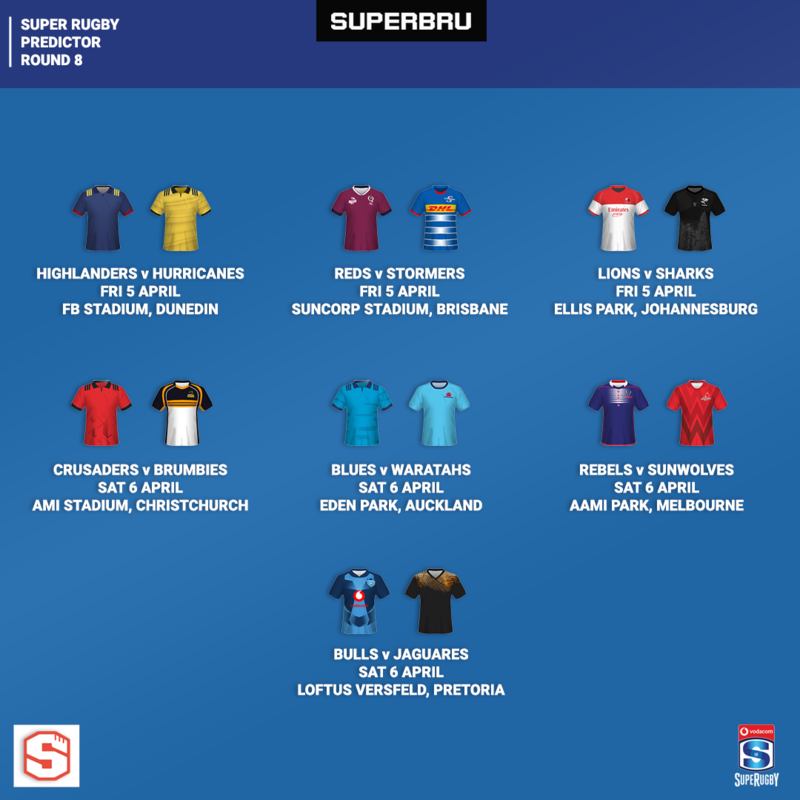 Super Rugby Round 8 Predictions! It was 3 out of 6 for me in Round 7, slightly better than the community average of 2.81, and thanks to a Margin Point in the Bulls' narrow win over the Sharks in Durban, I managed some green arrows on the Superbru rankings. It's great to see that the bru on the above banner, Jaco Marais, who was the best performing player across the entire Superbru community last week is playing in my 'Challenge Hutch' pool! He was of course the Yellow Cap winner after an incredible GSP round. Last week was a reminder that Super Rugby has been a bit of a lottery this season. Take the Waratahs - they beat the defending champions Crusaders one week, and lose to the lowly Sunwolves the next. Or even the Crusaders - beaten in Sydney, and then they thrash the Hurricanes in Wellington. So with that in mind, let's look at this week's coin flips. Which ones do you disagree with this week? I'm gambling with a Reds win and the Canes are due a big game.Reds by 6 Canes by 4. Auckland isn't the Capital of New Zealand, where did you get that from. "Oh it's the biggest City so I'll just take a wild guess and say it is", get your facts straight. Heya Craig. Learn some manners! Very disrepectful of you with that comment. I am with some guys with the Reds and the Hurricanes. Doubt it if the Sharks can cause an upset. With some of the results that have popped up this season I wonder if anyone has thought about some match fixing or something??? happens in other sports. For me it's Reds, Canes, Lions and Bulls.Crusaders revenge with a big score 25+ good luck. No sharkie lions by 7.you lost your mind.& agread reds to win & hurricane to win. The Bulls where horribly poor against the Chiefs and Sharks (actually neither the Bulls or Sharks should have won that game), and they are resting key players, I feel that the Jaguares will take this one. If they get their set pieces right, the Bulls is going to have a long day on their home pitch. I also feel that the Stormers can win the Reds. Both teams had poor games up to now, but I feel that the Stormers where better than the Reds thus far. The only worry for me for the Stormers is JL and Die Ellendige, they have been very very poor tactically and defensively, and if the Reds can exploit that in the way the Canes and Blues did, it might be 0/3 for the Stormers on the road. I don't like bringing the board room onto the rugby field, what I read recently regarding the Stormers, WP et al, if they win another game this season I will very happy. The Kings, now under private ownership, will, in the next 3 years, compete with the best in Europe. PG the same happens to Stormers/WP rugby. They will then be a force in Super Rugby. Until then NIX. Want to make money? Bet on stormers loosing next 10 games. Bulls v Jags...I'm going with the Jags simply because the Bulls are resting players. But I might end up with egg on my face! Can I still start an argument about what the Capital of South Africa is? Auclkland is regarded as the 'Queen City of NZ' btw. And it has nothing to do with the way The Blues play. At least the IPL has avoided this confusion by renaming the Daredevils.